I have knee ligament/cartilage trouble, will it help? Firstly, on our recommended settings, the ski~mojo will reduce the load your knees have to endure by around 33% thus reducing the stress your knees are subjected to. This will allow you to be more in control of your skis, reducing the risk of further injury and reducing or eliminating any pain or discomfort that you may normally be accustom to. Secondly, the ski~mojo is a shock absorbing suspension system. Normally when skiing you have constant “chatter” going through your knees which can cause irritation and subsequent swelling of the knee. The ski~mojo absorbs this chatter and any compressions. I have hip/back trouble, will it help me? Almost certainly, as normally when skiing you get constant “chatter” going through your whole body; as the ski~mojo is a shock absorbing suspension system it reduces the stress and vibration/jolting that your back and hips have to endure. The ski~mojo also supports you in a good posture as it mimics an ergonomical (or kneeling) chair, which also takes strain from the back. Where can I purchase a ski mojo? You can purchase your ski~mojo via our website and during the Northern-Hemisphere ski season we will usually send your purchase to you the same day (for orders placed before midday on a work day) or the next working day, by next-day-courier. Outside of the ski season orders are usually shipped within seven days. You can visit one of our authorised Agents and purchase your ski~mojo from them. A list of our Agents can be found on our Stockists/Agents page. 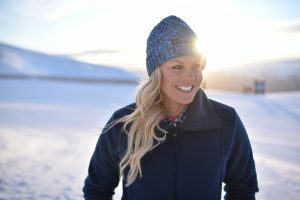 Will the ski~mojo affect my skiing technique? Yes – in a positive way! The ski~mojo will work with your natural articulation when skiing and it will help you to maintain the correct posture , also as it takes less physical effort to ski, it is easier and you can ski for longer, all factors which help you to improve your skiing technique. Will it hurt if I fall while wearing the ski~mojo? Falling while wearing the ski~mojo is usually no different than if you fell without one. As the ski~mojo runs down the side of your leg it works as side impact protection bars, just like those on a car and will often reduce the affect of any impact. However, under certain circumstances: e.g. if you fall on the end of the upper telescopic rod, it may cause bruising (in the same way as if you fell on your keys if you had them in your pocket. There is a layer of Neoprene between your leg and the rod, which can usually be folded over and “doubled-up”; you may wish to add additional padding to fit between these rods and your legs to further help reduce the risk of bruising. If you fall or are hit by another skier/boarder from the side then the ski~mojo will take the majority of the impact rather than your leg. It will spread the impact down the length of the ski~mojo which has the effect of cushioning any impact you receive. If you were not wearing the ski~mojo, then any impact would be felt directly on the side of your leg. We cannot make any claims that the ski~mojo is impact safety equipment. The above is based on the anecdotal evidence of several ski~mojo users. The most relevant anecdotal evidence is that we have not heard of a single injury (other than normal bumps and bruises) sustained by a ski~mojo user other than in circumstances where they fell that the injury would have been worse if they had not been wearing their ski~mojo. What guarantee do you get with the ski~mojo? In the unlikely event that your ski~mojo fails, there is a full warranty to cover replacement and repair within the first year. In reality (other than general wear and tear) we will repair any faulty part irrespective of the date of purchase. What is the weight of a ski~mojo? The total weight of the whole kit is 2Kg. What needs to be considered is the fact that when you are skiing the ski~mojo is supporting some of your weight rather than you carrying its weight. Won’t my thigh muscles just waste away if I use the ski~mojo? The answer is a definite NO. In fact you will probably build them up even more, as overall you will use them a lot more, just at a lower, safer work-level. When we overwork our muscles they produce more Lactic Acid than they can cope with. It is this build up of Lactic Acid which causes “thigh burn” while skiing and stiff legs the next day. We overwork our thigh muscles in relation to the rest of our body when skiing, so it is usually the thigh muscles that limit the amount of skiing we can do. The rest of our body is up for more! 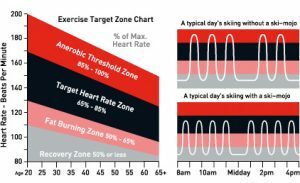 When you exercise you should try to keep your Heart Rate in the “Target Zone”, 65%-85% of your maximum. Anything higher and you will be getting into the “Anaerobic Zone” which means you will be producing a lot of lactic acid in your muscles and you will tire very quickly. This is generally what happens when we ski. Using the ski~mojo reduces the work that your thigh muscles have to do by around 33% and this is usually more than enough to keep you out of the “Anaerobic Zone” and in the “Target Zone”. As a result you can ski longer and harder which increases your heart rate (within the Target Zone) which burns more calories thus helping burn fat faster and helping the heart to become fitter. Also, your knee cartilage and ligaments take a pounding when skiing. The ski~mojo acts as shock-absorbers, taking up to 30% of the strain off and therefore protecting the joints and offering skiing injury prevention. ski~mojo turns your skiing day in to an all-round work out! How long does it take to fit the ski~mojo? The initial fitting should take no longer than a few minutes, only one tool is required and that is a small Allen key that is supplied with the kit. After that it will take very little time to put on and take off each day you ski. Simply put it on in your room before you put on your ski trousers (see fitting instructions for how to do this) then pull your ski trousers over the top and head down to the boot room to put on your ski boots. Once your ski boots are on then it’s a simple case of connecting the ski~mojos to the attachments on your ski boots. Do I need any tools to fit the ski~mojo? The only tool that is required is a small Allen Key that you receive with the kit. adjust to the spring tension to suit your weight. Will it fit under my ski trousers? The ski~mojo should fit comfortably under most ski trousers other than the tight-fitting “racing style” ski pants (or trousers that are tight around the hips or knees. What do I need to put on my ski boots? There is a clamp for each boot that sits on the back of the shell of the boot. Once you are happy with the positioning, ideally you should fit the boot fittings permanently:- Drill a hole through the boot where the attachment was clamped and then screw it on to the boot using the Allen Key and a spanner (or pliers) to permanently fix the attachment. This permanent fitting is recommended, but optional; the clamp should work just as well, but is a little bulkier and could get knocked off. We strongly recommend that you do not fit the attachments permanently until you have tested the set-up with the attachment clamped in position to start with, this way you are able to fine tune the position of the attachments, if required before committing to the permanent position. Can I use the ski~mojo on hire boots? Yes, the boot fitting that is supplied with the kit can be either permanent or temporary. It can therefore be clamped to the hire boot and then removed at the end of the hire period without causing any damage to the ski boot. What do I do if I change my ski boots? This is not a problem; simply remove the attachments from your old boots and re-fit on to your new boots. Does the ski~mojo come in different sizes? No the ski~mojo is one-size-fits-all. It has telescopic adjustments to fit your leg size. The Posture-Strap and Knee-Supports have Velcro adjustment so you easily adjust it to the correct setting for you. The only choice that you need to make is which spring strength to select. There are two standard strength springs. The strength you select relates to your weight. Silver springs are suitable for skiers weighing 55Kg to 85 Kg. Blue springs are available by special order only and are suitable for skiers weighing under 55Kg. How do I go to the loo? Undo the buckles on the elastic groin straps and disconnect the poppers on the top of the telescopic rods by pulling on the webbing tags: Then lift the Webbing Loops off the telescopic rods which will enable you to Lower the Posture-Strap. Reverse the procedure to re-attach when ready. Can I use it with my knee brace? Many people find that using the ski~mojo removes the need to wear a knee support or knee brace. However if you do need to wear a knee brace (if it has been prescribed), then the ski~mojo should fit easily over any knee brace. How do I get on the ski lift and sit down for lunch? The ski~mojo can be switched on and off with the flick of a switch (actually two switches – one on each leg); you should always switch both switches on or off. i.e. don’t walk around or ski with one leg switched on and one switched off. Whenever you take your skis off you should turn off the ski~mojo so you can then move around freely. With the ski~mojo switched off you can sit down, drive a car (take your ski boots off too!) and get on the ski lifts, in fact do almost everything as though the ski~mojo was not there. The only time you really need to switch the ski~mojo off while you have you skis on, is before you ride a chair lift. Switch off while queuing for the chairlift, get on the chairlift as normal. If you forget to switch off before you get on a chair lift you may find riding the lift uncomfortable as your legs will be being pushed straight, simply switch off then, if you can, fully straighten your legs and the mojos will disengage. Can I walk normally while wearing it? As with the answer to “How do I get on the ski lift and sit down for lunch” – yes. All you need to do is turn off the ski~mojo and fully straighten your legs to disengage, then you can walk as normal. It is like you have not got it on. Can I drive in it? Yes, just turn off the ski~mojo and drive as normal. Just ensure that the ski~mojo neoprene Knee-Support straps are reasonably tight so there is no risk of it slipping down while driving (and make sure that you’re not wearing your ski boots). How do I switch it on and off? There is a switch halfway down the side of each leg. To turn the ski~mojo on/off just flick the switches on each leg and then once you straighten your leg(s) the ski~mojo will switch on or off, depending on what you selected. Can I wear it outside my skiwear? There is more chance of the switches getting knocked accidentally. The posture strap could potentially catch on chairlifts etc. You cannot pull your ski trousers down over your ski boots (due to the attachment). If snow gets into the mechanism it can get compacted/frozen and potentially jam the mechanism. The ski~mojo was developed over a number of years by a group of British skiers and engineers. Owen Eastwood came up with the idea when his thighs were “burning” after skiing for the first time in his 50’s. When he returned from his first ski-trip he set up a small team of engineers to come up with a solution to his “thigh-burn”: After many incarnations and names the ski~mojo was launched at the Manchester ski show in October 2007. The ski~mojo proved an instant success and won several awards including the prestigious “Winter Hardwear Award” at ISPO, the worlds largest Sporting Goods Trade Fair. Based on customer feedback the ski~mojo was completely re-designed by Martin Hannaford, the current MD, and Owen who was terminally ill was shown and approved the final pre-production prototype of the new design (which maintained the original product’s core fuctionality) just four days before he died. The all new design was launched a few short weeks later in October 2010. Owen was keen that the ski~mojo would continue long after he had passed on and he hoped that happy skiers would occasionally raise a glass to “whoever came up with the idea for the ski~mojo”. So when you’ve had a great day on the slopes and in part it’s been down to the ski~mojo – remember to raise a glass to Owen……….